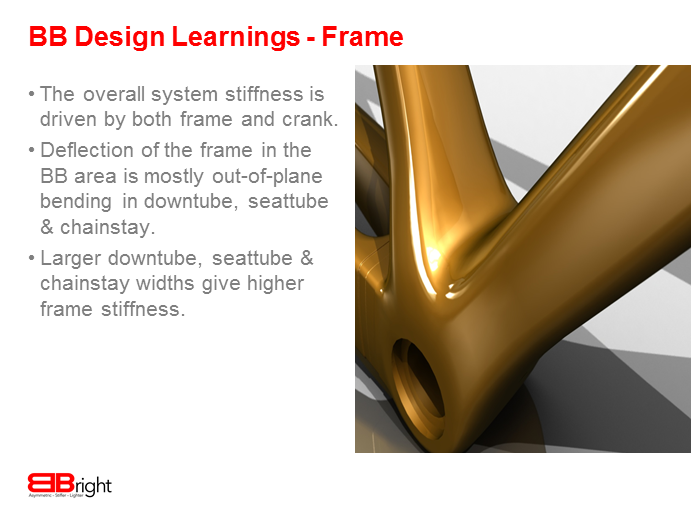 A. BBright™ is a new bottom bracket dimensional standard. 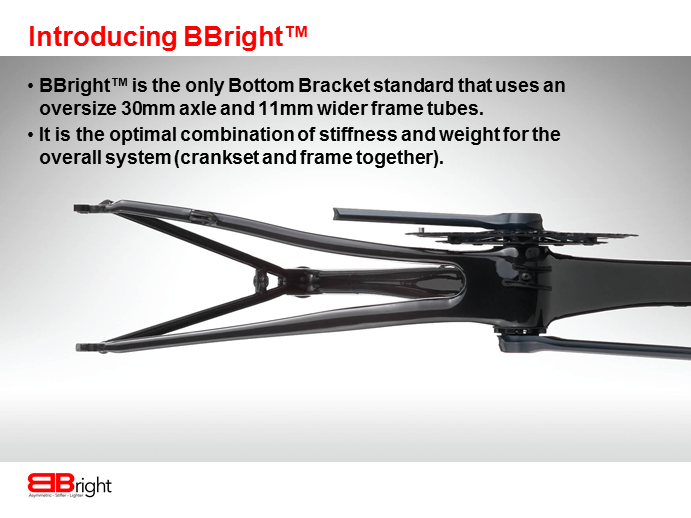 BBright™ is the only bottom bracket standard that allows an oversized bottom bracket axle (30mm diameter) and oversized chainstay, seat and down tubes (11mm wider). 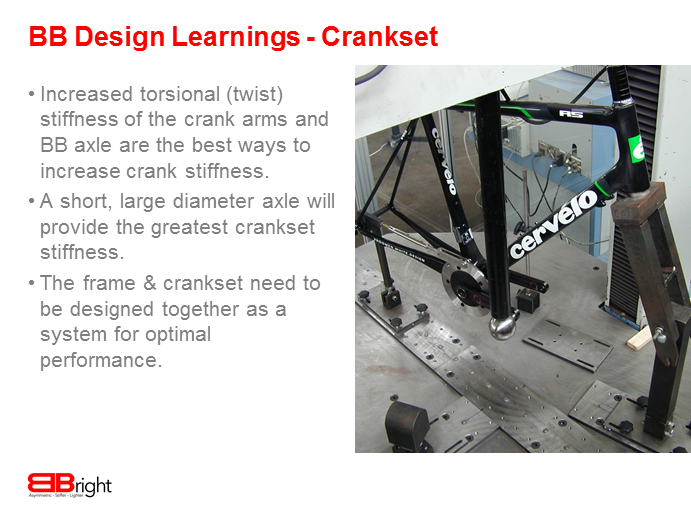 This is the optimum combination of dimensions for the best structural efficiency of the crank and frame system. Q. 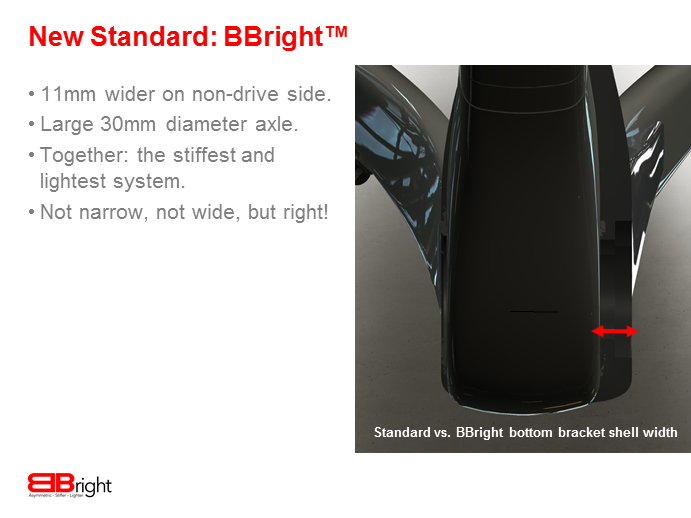 What is the difference between BBright™ and BB30™? A. For the crank, BBright™ uses the same diameter axle as BB30™, with the addition of 11mm length on the left side of the spindle, and the left crank is straighter, (similar to existing arms for external bearing cranks). For the frame, the bottom bracket shell is 11mm wider on the left side. 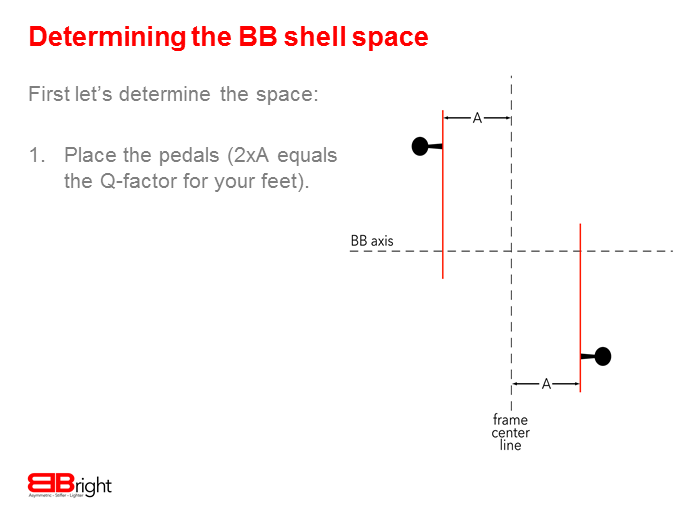 BBright™ leaves the pedal stance width unchanged, but provides the frame designer with 11mm more room to increase frame tube widths and thus structural efficiency. 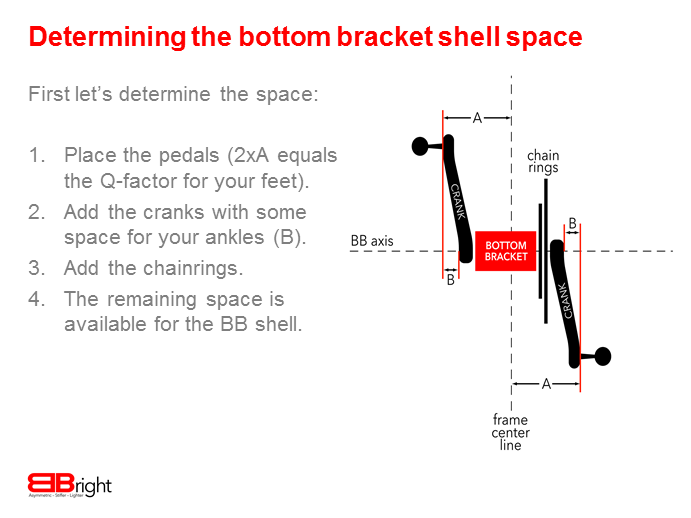 BBright™ does not increase width on the right side because that space is used for the chain rings; extending the bottom bracket shell on the right provides no structural benefit to either frame or crank. Q. 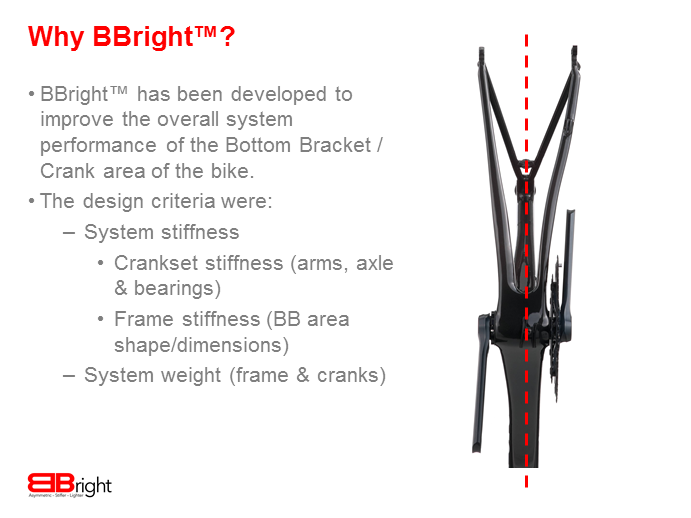 What is the difference between BBright™ and a traditional bottom bracket? 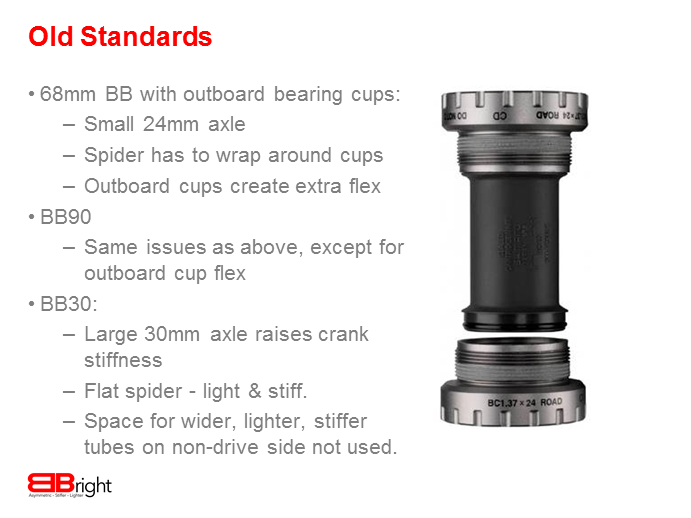 A. BBright™ uses a 79mm wide bottom bracket shell, while traditional bottom brackets are 68 (or 70) mm wide. BBright™ leaves the left bearing about where it is in external bearing bottom bracket systems, but replaces the external aluminum cup with the wider bottom bracket shell for more frame stiffness. Q. 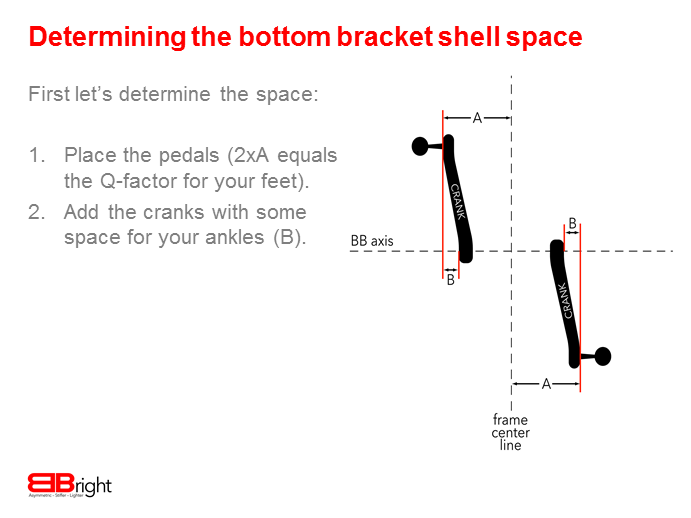 Is the BBright™ pedal stance width different from normal cranks? A. No. 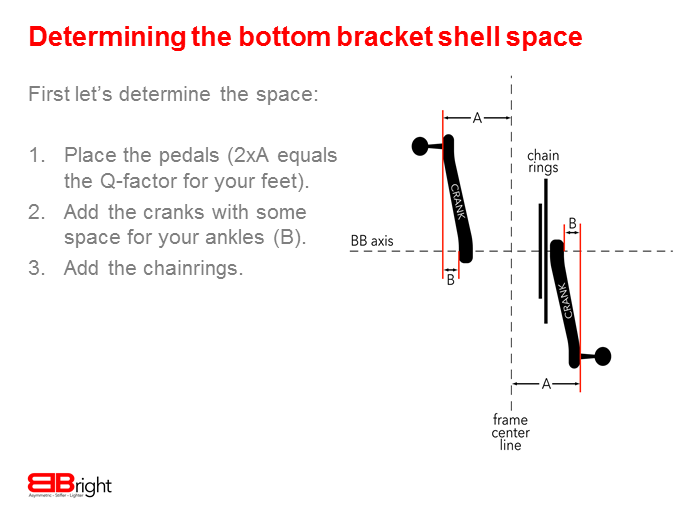 The Q-factor (pedal stance width) is the same as normal cranks. Q. 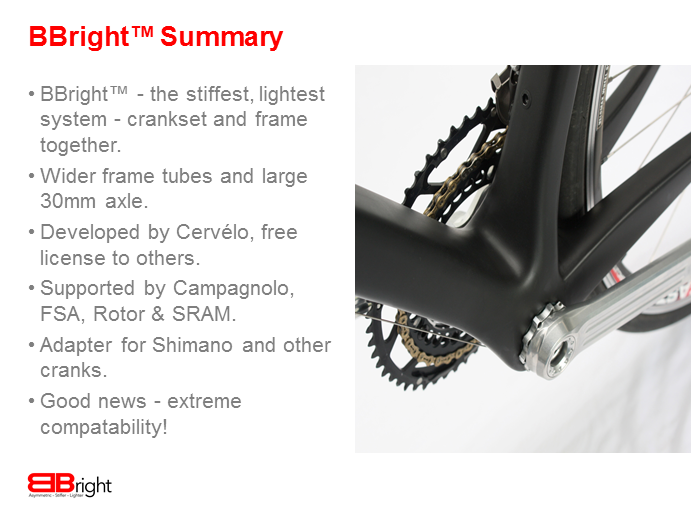 Which manufacturers produce cranks specifically for BBright™? A. Campagnolo, FSA, Rotor, SRAM, with more to follow. See the compatibility table for details. Q. 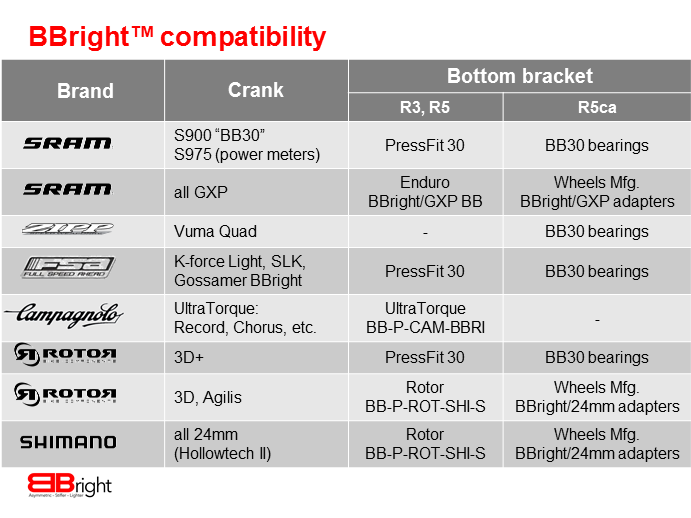 Will Shimano cranks fit in a BBright™ frame? A. Yes. An adaptor is available from your retailer to fit Shimano cranks with external bearings into BBright™ frames. See the compatibility table for details. Q. Will older cranks fit in a BBright™ frame? A. Yes. External-bearing cranks from Shimano, FSA, Campagnolo, etc. fit with the appropriate adaptor. See the compatibility table for details. Sixty-eight millimeter only BBs (square taper, ISIS, Octalink) do not fit. Q. Where can I order spare parts? A. Crank spares are available through the usual channels (distributor & local bike shop). 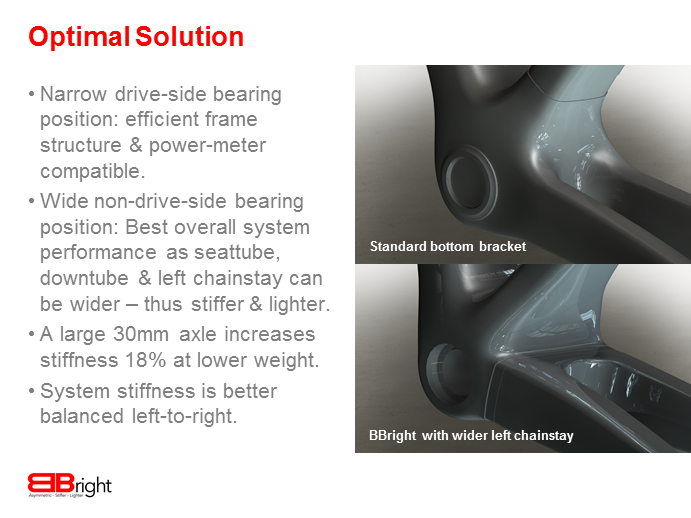 BBright™ frames with direct-fit bearings use standard BB30™ bearings (61806). BBright™ frames with bearings in PressFit30 cups use SRAM’s PressFit30x79 (or compatible) bottom bracket. Q. What is the life span of a bearing? A. BBright’s PressFit30 bottom bracket houses the bearings in an engineered polymer cup, which self-aligns to a degree even in a poorly aligned frame. Therefore bearing life is about the same as a well-aligned BB30™ bearing, and better than a poorly aligned BB30™ bearing.